Albanian (shqip [ʃcip] or gjuha shqipe [ˈɟuha ˈʃcipɛ], meaning Albanian language) is an Indo-European language spoken by approximately 7.6 million people, primarily in Albania, Kosovo, the Republic of Macedonia, and Greece, but also in other areas of Southeastern Europe in which there is an Albanian population, including Montenegro and the Preševo Valley of Serbia. Centuries-old communities speaking Albanian-based dialects can be found scattered in Greece, southern Italy, Sicily, and Ukraine. As a result of a modern diaspora, there are also Albanian speakers elsewhere in those countries as well as in other parts of the world, including Austria, Germany, Hungary, the Netherlands, the Scandinavian countries, Switzerland, the United Kingdom, Brazil, Canada, the United States, Australia, New Zealand, Singapore, andTurkey. Albanian is often seen as the descendant of Illyrian, although this hypothesis has been challenged by some linguists, who maintain that it derives from Dacian or Thracian. (Illyrian, Dacian, and Thracian, however, may have formed a subgroup or aSprachbund; see Thraco-Illyrian). Albanian was proven to be an Indo-European language in 1854 by the German philologist Franz Bopp. The Albanian language is its own independent branch of the Indo-European language family with no living close relatives (even though there are many dialects of Albanian, many distant and remote). There is no scholarly consensus over its origin. Some scholars maintain that it derives from the Illyrian language while others claim that it derives from Daco-Thracian (Illyrian and Daco-Thracian, however, might have been closely related languages; see Thraco-Illyrian). A recent linguist has even stated that Illyrian and Thracian may have been as close as Czech to Slovak (Paliga, 2002). A more concrete evidence of the Illyrian-Pelasgian origin of the Albanians is supplied by the study of the Albanian language. Notwithstanding certain points of resemblance in structure and phonetics, the Albanian language is entirely distinct from the tongues spoken by the neighboring natonalities. This language is particularly interesting as the only surviving representative of the so-called Thraco-Illyrian group of languages, which formed the primitive speech of the inhabitants of the Balkan Peninsula. Its analysis presents, however, great difficulties, as, owing to the absence of early literary monuments, no certainty can be arrived at with regard to its earlier forms and later developments. 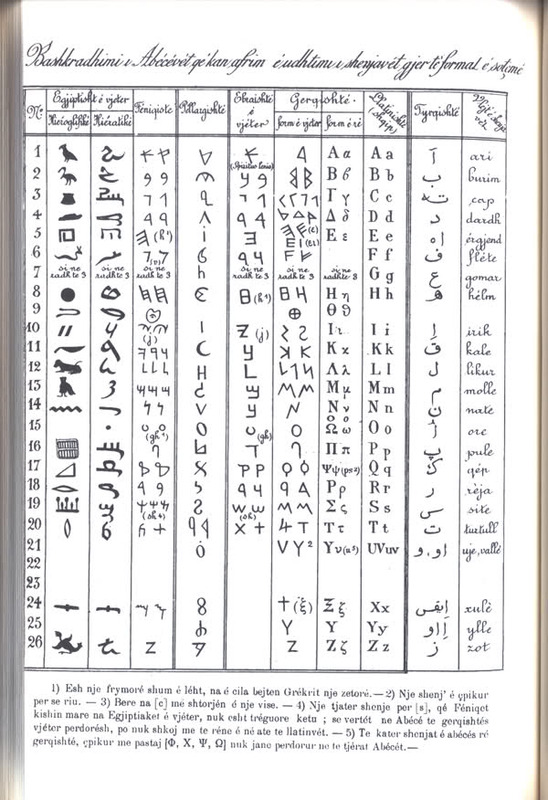 In the course of time the Albanian language has been impregnated by a large number of foreign words, mainly of ancient Greek or Latin, which are younger than the Albanian Language, but there are certain indications that the primitive Illyrian language exerted a certain degree of influence on the grammatical development of the languages now spoken in the Balkan Peninsula. The Tosk dialect is spoken among the people who live south of the Shkumbin river. The Albanian language is divided into two basic dialect groups: Gheg in the north of the country and Tosk in the south. The Shkumbin River in central Albania, flowing past Elbasan into the Adriatic, forms the approximate boundary between the two dialect regions. Here, in a zone ten to twenty kilometers wide, intermediate dialects are also found. 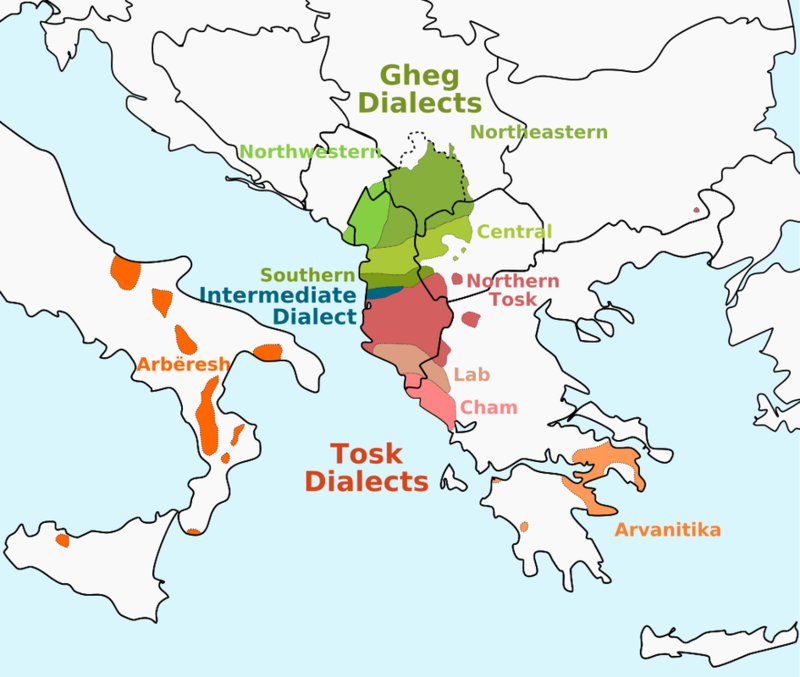 The Gheg dialect group, characterized by the presence of nasal vowels, by the retention of the older n for Tosk r (e.g., venë “wine” for Tosk verë; Shqypnia “Albania” for ToskShqipëria) and by several distinct morphological features, can be further classified into a northwestern (Shkodra and surrounding region), a northeastern (northeastern Albania and Kosova), a central (between the Ishëm and Mat Rivers and eastwards into Macedonia, including Dibra and Tetova) and a southern (Durrës, Tirana) Gheg dialect. The Tosk dialect group is in general more homogenous, though it can be subdivided into a northern (from Fier to Vlora on the coast and all of inland southern Albania north of the Vjosa River), a Labërian or Lab (south of the Vjosa to Saranda), and a Çamërian or Çam (the southern tip of Albania and into Greece) dialect. The modern literary language (gjuha letrare), agreed upon at the Orthography Congress of 20 to 25 November 1972, is a combination of the two dialect groups, though based about eighty percent on Tosk. It is now a widely accepted standard both in Albania and elsewhere, though there have been increasing tendencies in recent years to revive literary Gheg. In its structure, Albanian is a synthetic language similar to most other Indo-European languages. Nouns are marked for gender, number, case and also have definite and indefinite forms. The vast majority of nouns are masculine or feminine, though there are rare examples of neuter nouns, which now function increasingly as masculine in the singular and feminine in the plural. As to number, nouns appear in the singular and plural, as in most other European languages. There are approximately 100 plural formations, including suffixes, umlauts, final consonant changes, and combinations thereof. Nordhoff, Sebastian; Hammarström, Harald; Forkel, Robert; Haspelmath, Martin, eds. (2013). "Albanian". Glottolog 2.2. Leipzig: Max Planck Institute for Evolutionary Anthropology. Robert Elsie (2010). Historical Dictionary of Albania. Rowman & Littlefield. p. 216. ISBN 978-0-8108-6188-6. Retrieved 30 September2013. Jump up^ Fine, JA. The Early medieval Balkans. University of Michigan Press, 1991. p.10. Jump up^ Fine, JA. The Early medieval Balkans. University of Michigan Press, 1991. p.11.